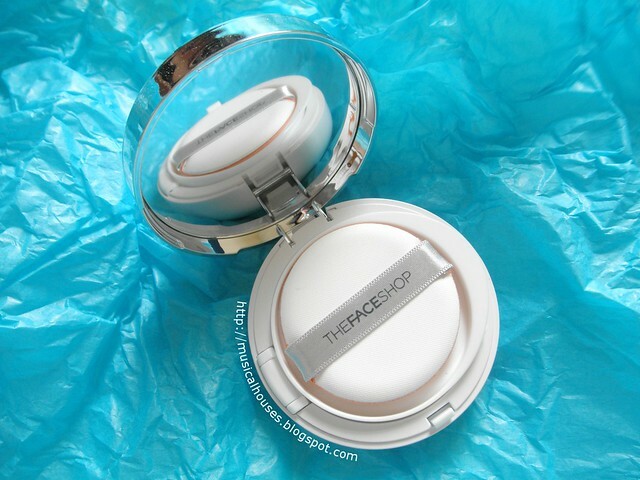 The Face Shop Oil Control Water Cushion SPF50+ PA+++ is the latest BB cushion to come from the brand, and it seems to have been advertised just for this hot weather we've been having - two of the key features being marketed are that it is waterproof, and has oil-control properties. That's gotta be good for hot weather, right? The Face Shop Oil Control Water Cushion comes in two shades, V201 Apricot Beige, which is the lighter shade, and V203 Natural Beige, the darker shade. I have V203 Natural Beige with me, and although it isn't the best match for my skintone because it was too dark and orange, but it was the "default" shade that was sent to me. Which is a pity, because the Water Cushion does have a lot to recommend it! So if you see me looking kind of Oompa Loompa orange in my FOTD or swatches, don't worry, it's the result of a less-than-optimal shade match! 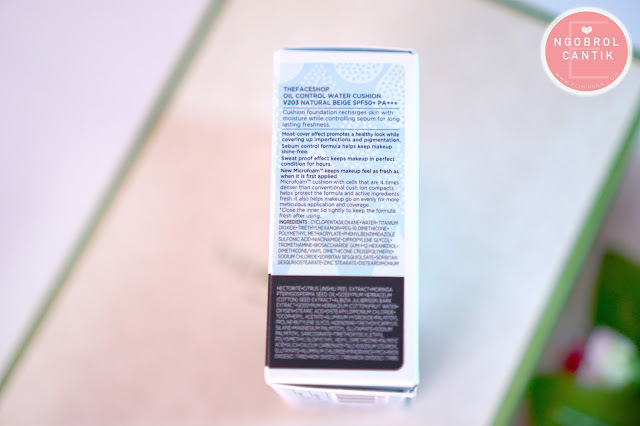 So, now that we've gotten that out of the way, let's start the review - by taking a look at the formula and ingredients list! I have to say, this is one of the most impressive blogger kits I've received to date. The entire Oil Control Water Cushion was mounted on an extremely creative swimming-pool-like board, which looked incredibly cute. (You can see photos of the board in action on my Instagram here, here, and here.) Unfortunately, the product sent to me didn't include the actual product box, which would have had the ingredients list. Not a problem though - a quick google pulled up photos of the actual packaging and ingredients lists (you might have to expand the photo in order to read it though). Anyway, the main ingredients are silicones (Cyclopentasiloxane, PEG-10 Dimethicone), water, UV filters (Titanium Dioxide, Phenylbenzimidazole Sulfonic Acid), emollients (Triethylhexanoin), film-forming agents (Polymethyl Methacrylate), humectants (Dipropylene Glycol, Biosaccharide Gum-1), and a skin-beneficial ingredients (Niacinamide). After this we hit the fragrance ingredient and pH adjuster (Tromethamine), as well as the main preservative (1,2-Hexanediol), which are typically used in small amounts of 1% and under for both Tromethamine and 1,2-Hexanediol, so after that, most of the rest of the ingredient are probably there in really low amounts. The rest of the ingredients include various functional ingredients like silicones (Dimethicone/Vinyl Dimethicone Crosspolymer), thickeners (Sodium Chloride, Zinc Stearate, Disteardimonium Hectorite), emulsifiers (Sorbitan Sesquioleate, Sorbitan Sesquiisostearate), pH adjusters (Aluminium Hydroxide), and a bunch of plant ingredients (Citrus Unshiu Peel Extract, Moringa Pterygosperma Seed Oil, Albizzia Julibrissin Bark Extract, Gossypium Herbaceum Fruit Water). I kid you not, but one of the minor ingredients listed is "Oxygen" (f you don't believe me, it's right after the fruit extracts). I don't know about you, but this one made me laugh. I'm not even sure how this is allowed on the ingredients list in the first place, but I don't know that much about regulatory matters. Well, oxygen makes up 20.95% of the air we breathe in, so I guess yeah, technically the product contains oxygen - along with every other product that was exposed to air before or during use. Anyway, amusing ingredients list aside, looking at the main ingredients, we can see that this is formulated to be a good base makeup product, with all the usual ingredients - silicones and film-formers so that it forms a nice layer on the skin, emollients and humectants for some moisturizing properties, and UV filters for sunscreen protection. I also liked the inclusion of Niacinamide, which is an ingredient that's pretty beneficial for skin too. Also, the choice of UV filters is pretty good too, with the Titanium Dioxide providing UVA1, UVA2 and UVB protection, and the Phenylbenzimidazole Sulfonic Acid providing UVA2 and UVB protection. Of course, if you're applying this as a base product you won't use enough to give you the full SPF stated on the packaging (if you were, it would be a pretty thick layer of product! ), but it's better than nothing. So, now that we've looked at the formulation of the product, let's get on to the aesthetics of the product! 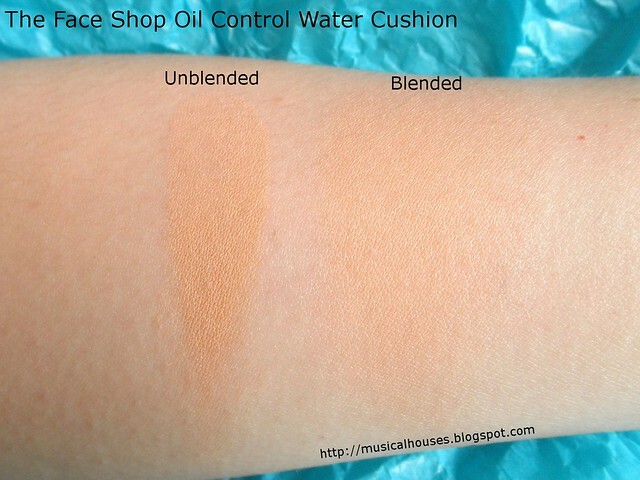 Below, are swatches of The Face Shop's Oil Control Water Cushion. It has a matte finish, and as you can see, this is a fairly warm-toned medium beige shade. I'm around NC20, so this is definitely darker than NC20. I'd say it's probably closer to NC25 or NC30 maybe? There is also no sheen or glitter bits in this product, so for those who have oily skins and don't want to draw attention to any grease or shine, this would also be a good choice. Also, this has a slightly thicker texture than a typical cushion, which is more watery, although correspondingly, it also has much greater coverage. I attribute this partly to the main ingredient being Cyclopentasiloxane, which is a volatile silicone that evaporates when applied to skin. 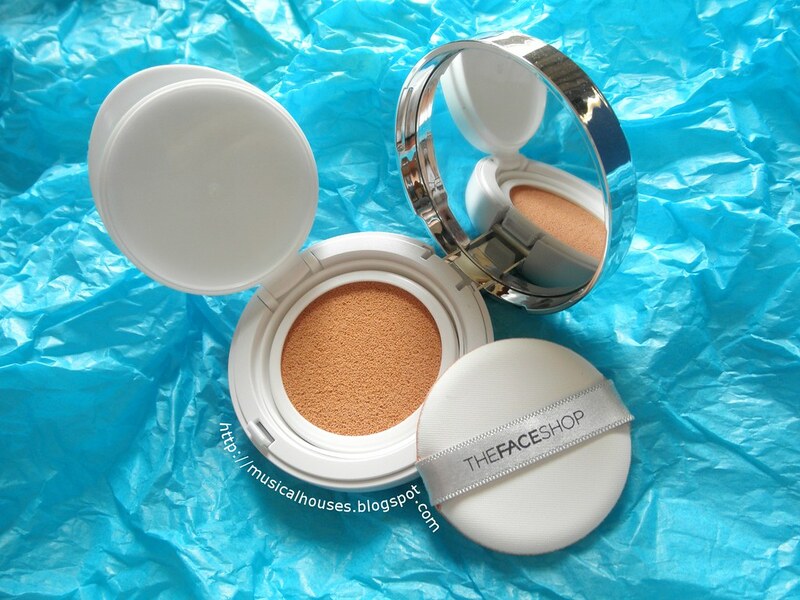 In this product, it makes the BB cushion "dry down" fast, which is useful if your BB cushion is matte. So now you know! 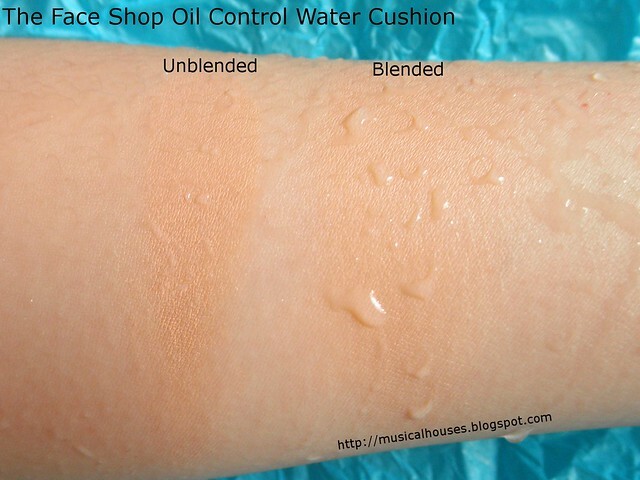 Now, let's test whether the Oil Control Water Cushion is really waterproof or not! After all, that's part of the advertising, right? To do this, I conducted two tests. First, I conducted the water test, where I ran my swatches under tap water, to see if the swatches would budge or disappear. Next, I conducted the water and rub test, where I rubbed at my swatches while they were run under a running tap, to see if they would still budge while actively rubbed under water. Above, you can see the results of the water test. Basically, the water ran over the swatches and didn't shift them or make them fade at all, which is pretty impressive! So yes, you can probably wear this and go swimming! And below, the results of the water and rub test. 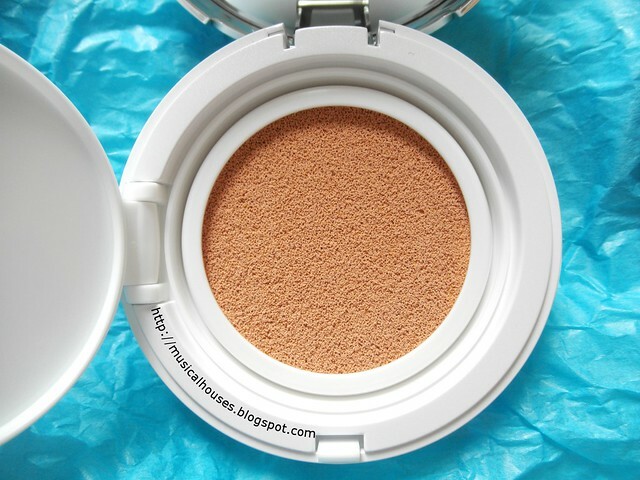 This is also really impressive - you can see that the BB cushion doesn't fade or shift either! So yes, swim away with this! And, it wouldn't be a good review without an FOTD (face of the day), so here you go! 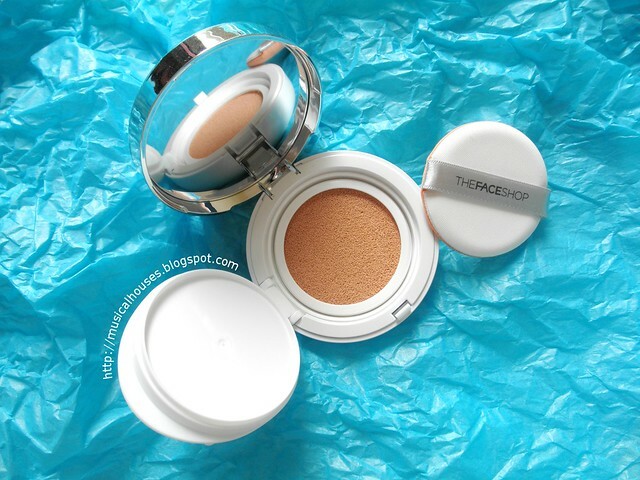 The Face Shop Oil Control Cushion in action on my face! It had a nice matte finish when I used it, and a slight floral scent that dissipates upon application. It also oxidized a bit and got darker on me, although I'm not sure how apparent that is from the photo below. It does rub off, but I imagine some setting powder should help to solve the problem. One last note - in some ways, this feels more like a traditional foundation in terms of matte-ness than a typical BB cushion. Most BB cushions seem to have a glowy or dewy finish, but this is definitely matte and has good coverage, and sits on skin like a foundation does. In fact, I found that I could cover some of my blemishes by just going over a second time with the Oil Control Water Cushion, rather than needing a separate concealer. 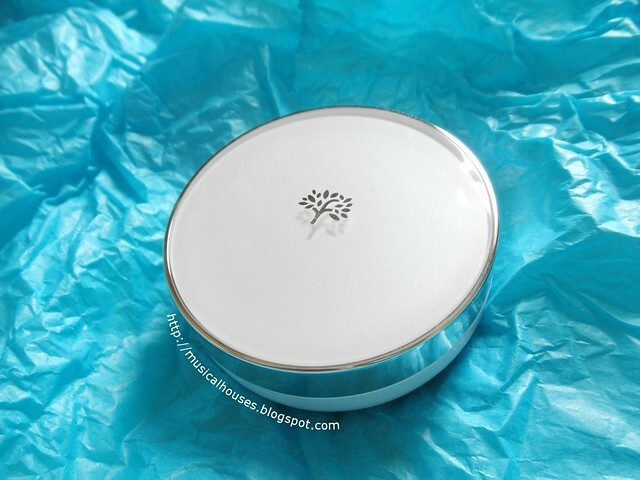 So, would I recommend The Face Shop Water Cushion? Why not - it has a good formula for a base makeup product, it is indeed waterproof with a nice matte finish, and it has good lasting power. So if that's what you're looking for, it's worth checking out, provided you can find a shade match in one of the two shades. 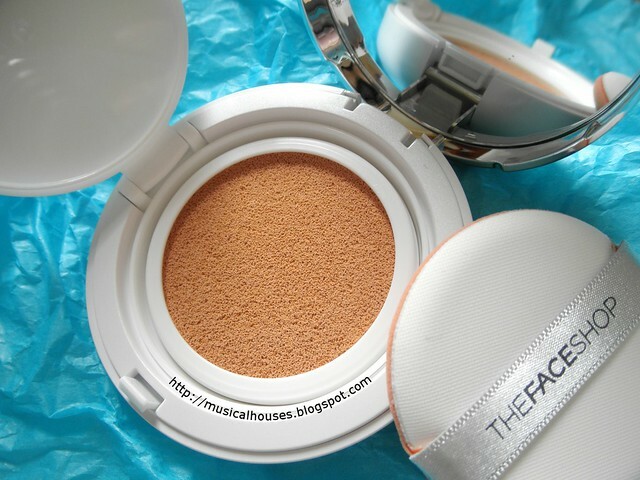 Essentially, it's like a foundation, but in BB cushion form. At SGD$29.90, it's also not too expensive. The Bottom Line: The Face Shop Oil Control Water Cushion is a BB cushion with waterproof and long-lasting properties and a matte finish. Amazing! I do wish, in general, KB offered more color variations! May this be available in Canada too. :) I'm crossing my fingers the lighter shade isn't too dark for me! Thanks for the review. Cheers! 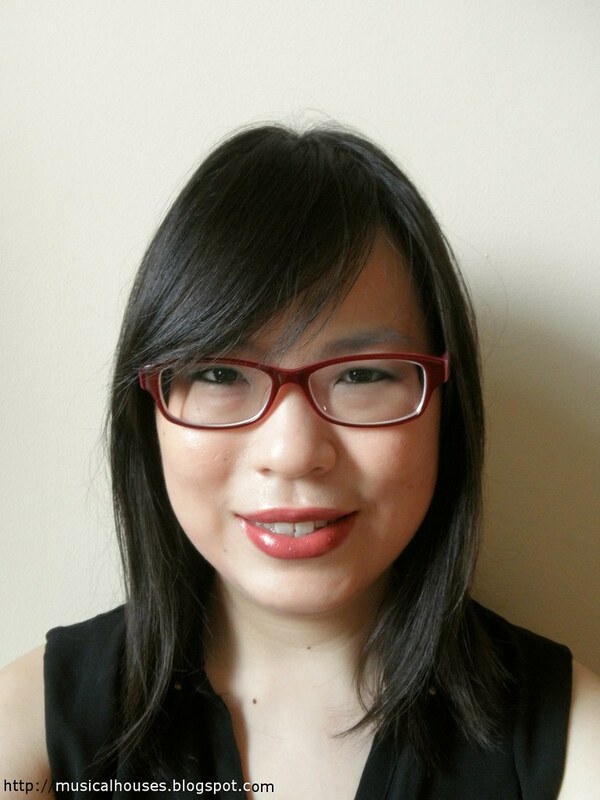 I love your new specs! OMG!!! This is superb! I want to have one of these. Interesting. Sometimes I look at BB cushion products and wonder how much product is there in the packaging? I really can't tell with the cushion at all. Anyway, love your new glasses. You look great! 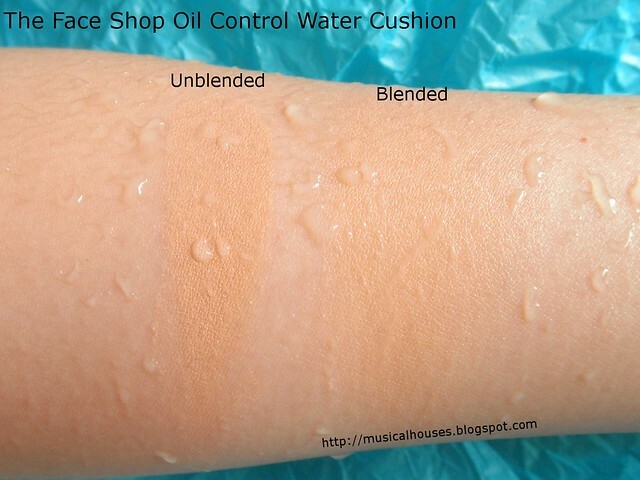 @sarahq: There is definitely less product in a BB cushion as compared to a normal BB cream - I think in this post (http://musicalhouses.blogspot.com/2014/01/bbcc-cushion-vs-bbcc-cream-whats.html), I looked at a few BB cushions and saw that they had around 15-20g of product, which is about half the amount you normally get in a tube. Seems like a great product! What an insightful post. Do you think it would be suitable for combi-drier skintypes? Thanks for the awesome review! This was the last push I needed to actually go out and pick one up for myself. I was debating if I should get this or Innisfree Long Wear Cushion.